The proposal was perfect and your wedding day is coming. There’s only one problem: your wedding ring set is still in the “idea” stage. No worries. Creating your own vintage wedding ring set is exciting and easy. Let these ideas guide you in creating a set that you adore. You can go a long way to creating the right ring set by writing down some ideas before you go online or make an appointment with your favorite jeweler. Material. If you love your active lifestyle and plan to keep your rings on, then your preference might be a stronger metal like 14 or 18 carat yellow gold. If platinum is more you and you want a white ring, then put platinum on your checklist. Style. Many brides-to-be have imagined their perfect wedding ring since childhood. When you have a set style in mind, either from a certain era, like the stunning Art Deco rings at Estate Diamond Jewelry, narrow your styles down to one or two. Shapes. Keep in mind that the shape and the band need to complement one another so that the band does not interfere with the stone. They don’t have to match. Budget. We all want to buy the vintage ring set that catches our eye, but when you have a specific budget, it’s good to start browsing rings in your price range. Once you compile your initial list, remember to be creative and be yourself once you go online or into the store to pick out your vintage wedding ring sets. Mix and match to create a unique set. Try different eras, mixing an Art Deco band with an Edwardian ring, or go for different metals on each piece. Remember, with vintage rings you see the colors so you don’t have to worry about the metal colors changing too drastically over time. You do need to be careful that a hard metal band does not scratch up or damage a softer metal engagement ring. If you love stones, then choose a band that also has stones. Most brides prefer to keep the engagement ring as the star, but you can mix and match to your heart’s content from the unique vintage rings at Trumpet and Horn. Never worry about matching to your partner’s band unless you want to. Consider proportion. It might not seem like a big deal, but you want the two rings to fit together, unless you are wearing them in untraditional ways. With one-of-a-kind vintage rings, you might not want the band stones to outshine the engagement ring. 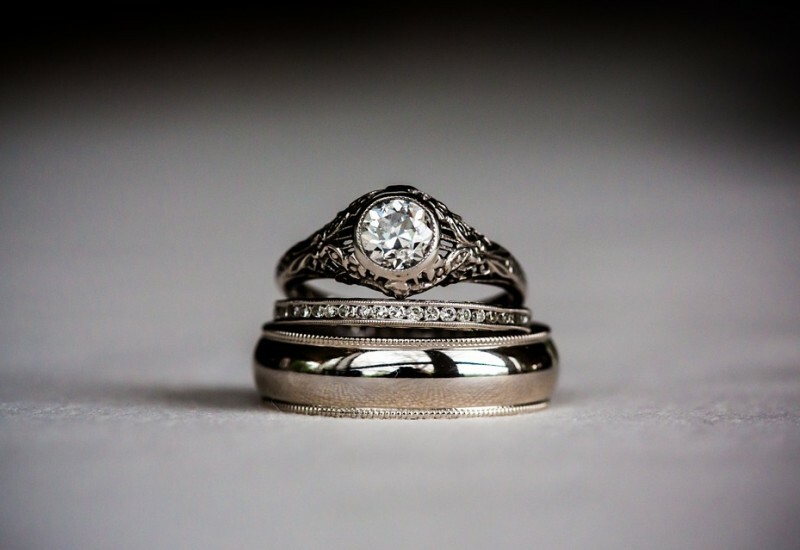 Your vintage wedding ring set is one of the few purchases that you make to literally last you a lifetime. Enjoy the search and find the vintage wedding ring set that simply takes your breath away.